“Chatham” sits on the foothills of the Liverpool Ranges, totalling a land area of 5,665 acres. All of which were once part of the historic Brindley Park owned by famed pastoralist James Brindley Bettington. The team at Crown State Pastoral Company vetted through a multitude of cattle stations throughout Australia and chose to acquire Chatham for its productive soil and reliable high rainfall country; making it a prized blue-ribbon cattle station. Blessed with naturally rich chocolate and black basalt soils, the cattle are raised on heavenly lush native and improved pastures in the renowned Upper Hunter region of New South Wales. Located on the southern foothills of the Liverpool Range, with elevation ranging from 480m to 800m above sea level, Chatham is diverse in terrain, ranging from creek flats to undulating and hilly slopes with ample trees for shade and shelter. 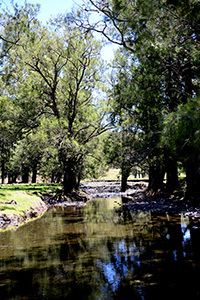 Pure, pristine water is supplied via the Coulsons Creek, Middle Creek, Gummum Creek and the Merriwa River as well as bore water pumped from a solar powered reticulation system that connects to the stock water tanks which then gravity feeds water to all the stock water troughs on the property. The team at Chatham is led by our Farm Overseer, Micky D. Rapley.